Featuring a full kitchen with a dishwasher and an oven Astoria Queens Town House is located in Queens just 20 minutes' metro ride from Midtown Manhattan. Free WiFi access is available throughout the accommodation. Air conditioning is provided in each room at the property. Featuring a shower and bath the private bathroom also comes with a hairdryer. 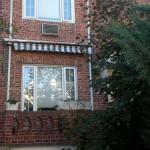 Featuring a garden where guests can relax Midtown Manhattan Town House also offers barbeque facilities. Free parking is located on site. LaGuardia Airport is just 10 minutes' drive from Astoria Queens Town House. Times Square is 20 minutes' metro ride away.